Update 9 February 2018 : Work has actually started on repairing the road between Thornton Rust and Cubeck! Aysgarth and District Parish Council press release concerning the dangerous condition of the road through Thornton Rust in Wensleydale. A narrow road, mostly single track with passing places, used as a diversion route when the A684 in Wensleydale is flooded is crumbling in three places beside a sheer drop down a scar. For 12 months Aysgarth and District Parish Council has been asking North Yorkshire County Council’s highways department to repair the road, particularly where a large boulder has fallen down the scar between Thornton Rust and Cubeck leaving the tarmac unsupported. “The A684 was flooded and everybody was going via Thornton Rust. A guy in a tanker that I was behind had to open a field gate and pull in because the road was gridlocked. He couldn’t reverse because there were cars behind him and the ones oncoming couldn’t reverse either. A photograph (above) was sent to the highways department but no response had been received. The councillors agreed that was unforgiveable. The parish council has told the highways department over and over again about the dangerous situation but no repairs have been carried out. In addition the heavy traffic along the road, which includes a very large whey tanker going to the Wensleydale Creamery, animal feed wagons and all the auction mart traffic, was mashing the verges. This has led to the drains being blocked and mud on the road. The councillors asked if a one-way route through Wensleydale could be considered, with traffic also being diverted through Askrigg. Cllr Blackie pointed out that there was a 17 ton limit on the road through Askrigg. Aysgarth and District parish council had asked for a similar limit on the road through Thornton Rust but the highways department had refused as it was the diversion route when the A684 was flooded. The highways department was criticised for the poor diversion signage and wondered if there could be gates on the A684 which could be closed when the road was flooded. The councillors were amazed at the number of drivers who had driven into the floods. 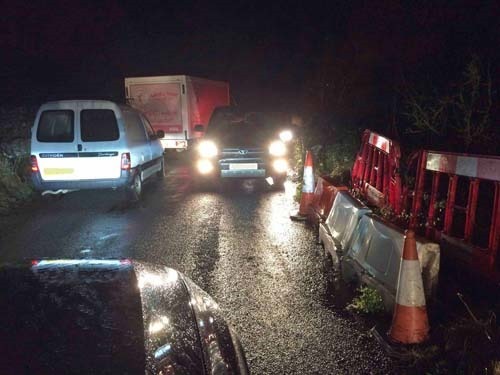 Councillor John Dinsdale reported that ten vehicles had been rescued including a highways department van. It was pointed out that several months ago representatives from the highways department had inspected the road above the scar at Thornton Rust and also the bridge at Bishopdale and had agreed that something urgently needed to be done to repair both. North Yorkshire County Councillor John Blackie said he would take the matter up again with the highways department. When the A684 was closed in West Witton a couple of years ago for resurfacing, traffic was diverted to the North side of the Dale whuch meant HGVs HAD to go via Askrigg and use the Bainbridge or Hawes bridges. So NYCC can lift a weight limit temporarily if they want.